I bet it’s been an interesting year so far for EVLUTION Nutrition. This company is best-known for their ‘ENGN’ Pre workout- a product that I reviewed a little while ago here on the blog. I don’t know if the product was actually unsafe or if the FDA was just looking to cause headaches for another corporation, but they certainly managed to do just that when they threw the ultimate wrench in EVLUTION’s wheels and deemed the ENGN pre workout unfit for safe consumption. Apparently the ingredient that they did not like was the Picamilon- which is some kind of hybrid ingredient consisting of niacin and GABA. This ingredient is not used in LeanMode, but I kind of wish it was because I really liked the effects of the EVL ENGN Pre Workout, even if it wasn’t deemed perfectly safe. But that just means I was pretty excited to try the LeanMode fat burner when it showed up on my doorstep two weeks ago. Let me take you through my mini-log and tell you if this stimulant-free fat burner worked for me. Does LeanMode Stim-Free Fat Loss Work for Women? That’s the question on Twitter that I received that started this whole thing. I wasn’t even sure that EVL had a popular fat-loss supplement until I went online and did a little bit of research on my own. I found that this fat loss supplement has actually several reviews (mostly positive), and that’s when I knew this was the right supplement for me to grab for my latest fat loss review. 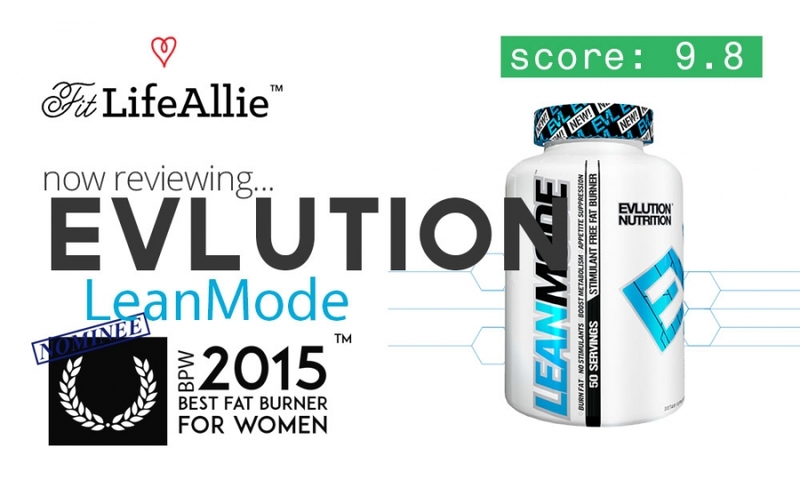 I snagged a jar of LeanMode by EVLUTION at 25% off the already super-low price-tag of $19.99. I don’t even know how they priced this fat burner so low, but I’m not complaining. I’m all about cost savings. Especially for fat burners that don’t have any caffeine in them. So here are my three check-ins during the past two weeks that will serve as my mini-log. Hopefully you get a sense of how this product worked for me by reading it. Day 7: I decided to wait an entire week this time before checking in with you guys on my results with LeanMode because I basically haven’t noticed a single thing until today. Today I woke up and went in for my workout and caught myself in the mirror on the way out of the locker room. And guess what? I looked exactly the SAME. Lol. I know. You were expecting something different. But really there was nothing new in my appearance. Things were the same. Alas. I have yet to see any results from EVL LeanMode. I think if you’re curious if women can take this product, the answer is easily a yes. I mean. Nothing has happened good or bad so that’s a finding in itself, right? I’ll be back to check-in on Day 11. Day 11: Four days after my negative-nancy log post and I think I’m going to hum a slightly different tune. After I showered this morning I had a peak at my physique and thought to myself ‘ok this is looking a little better’. My midsection, which has looked the worst it has in probably 5 years since my injury, had just a little more tightness in the skin than usual. To the touch I could tell it was a little bit firmer and more toned. I’ll see if this was real or just me imagining it at the end of the log. Day 15: Ok, so my time with LeanMode is over and I must say it took about 12 days for anything to happen, but I made an even more conscious effort to eat cleaner foods and see if my body would tighten up at all. And I have to say, I think it really did do something. It’s a much less dramatic effect than from some of the more top-shelf fat burners out there (and by top-shelf I mean have stimulants and other patented ingredients), but this product did have an impact on my body. If you need a ‘yes/no’ answer to ‘Does LeanMode Work?’ I’m going to give you a ‘yes’. My skin is tighter, and revealing more definition. It’s nothing terribly dramatic, but it’s a reality that I do look a little bit leaner than I did two weeks ago. Let’s look at the ingredients in LeanMode and see what we can see. I don’t have too too much to say concerning this formula just because I feel like we’ve seen products like this so often before that it’s hard to say for certain that this one is much different than any others. I think I’ve tried formulas near identical to this one, and had very comparable results. These types of products always seem to make a difference, even if they aren’t total transformations. But I think Acetyl-L-Carnitine will always be a staple of my fat loss regimen- whether I’m taking it as a standalone or whether I’m getting it as part of a fat loss pill like this one. I’ll give an even 8.5 even though it’s an odd number, it’s still ‘even’ in the sense that it’s evenly between an ‘A’ and a ‘B’. Meaning it’s adequate without being impressive. This fat loss supplement from EVL Nutrition is package much the way you would expect for an $18 fat burning supplement. There’s a basic white jar covered in black, silver, and blue graphics. It’s a business-like approach that conveys a sense of simplicity and time-tested results. In that way I think it sort of matches the ingredient panel within. There’s nothing fancy about it. There’s nothing ‘risque’ about it. In comparison to the EVL pre workout, the LeanMode Fat Burner plays it safe. The EVL pre workout has a crazy color-shift label that is actually an industry first. This one is the industry basic. I wonder if the all the nonsense abou tthe pre workout and the FDA and the ban and everything made them want to pull in the reigns and fly under the radar with more of a basic formula and appearance. I enjoyed this product, but wish they had brought a little bit of the EVL ENGN flair to their LeanMode Fat Burner. Even if the formula wouldn’t have been able to match the flair of the label, it would have been cool.